The Resources and Human Impact SciPack, co-developed between NOAA and NSTA, explores the role society plays in environmental degradation, and the technological solutions, including resource management, that arises from environmental issues. Human beings modify all components of Earth’s ecosystems as they use and consume available resources. The amount and rate of consumption is affected by the population growth and access to technology. This SciPack is focused on Standards and Benchmarks related to interactions in and between ecosystem; population growth and carrying capacity; resource use; and environmental degradation and changes to Earth’s systems. I really like SciPacks because they give me all of the information that I need to refresh my memory on different topics. This SciPack was great because I was teaching a unit on Human impact. This SciPack allowed me to revisit the information that I needed in order to teach my students. 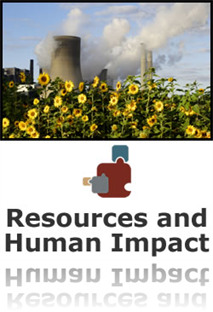 This SciPack provides a good review of the topics of resources and human impact. The NSTA did a nice job of presenting the information in an easy to understand manner. The structure of the SciPacks really help me understand the underlying concepts that surround each topic. I had a lot of fear of science before learning about the NSTA Learning Center, and Initially, I was unsure of how well I'd grasp scientific concepts in a self-paced, online format. However, the carefully sequenced topics, interactive activities and simulations, in addition to the voice-over explanations work well together to help deepen my understanding in the content area. Especially valuable are the pedagogical implications and common student misconceptions. I feel a lot more knowledgeable about a subject after using a SciPack, and I highly recommend the Resources and Human Impact SciPack to anyone needing to learn more about this topic or review key concepts. I really liked this SciPack. The information is so eye-opening and the ability to do the Carbon Footprint really helps to visualize the impact each of us have. Packed with great info, simulations, and visuals. It is an excellent review of the topic. The interactive activities make the abstract more concrete and understandable. I wonder about using them with my 5th grade students, if they are available I might attempt it. This scipack is very thorough as it begins with a definition of the Earth's systems and details the components of how systems interact and its influences of life on Earth. It also details the impacts of outside influences such as things that humans do and how it affects the systems of the Earth (positive as well as negative impacts) As a kindergarten teacher, it is my responsibility to introduce the living and non-living units. Taking what I learned in this scipack will allow me to go further and teach my students things that influence as well as impact the living and non-living components on our Earth. One thing that stood out for me as I was reading this scipack was a misconception that was brought up that middle school students may have -is that life is organized in separate levels and things we do will/may not have an impact on other levels when it most certainly does. I think that at the kindergarten level when we introduce the living and non-living unit, we should already start to teach the students the importance of how everything we do now will affect ALL levels of life. I'm about half way through this Scipack and I really like it. The questions are straightforward and not "tricky." It presents things in an unbiased way, yet covers all the bases. I just completed this scipack and learned a lot. The information was presented in a very logical and sequential manner. I would recommend this unit for studying and completing. I learned a great deal from this SciPak. It did an excellent job of sorting out all of the sides to environment impact, and presented it in a non-political but urgent way. I feel that the interactices inside it would be very useful with kids, especially the detailed case studies and the carbon footprint activity. I am glad I took it. It has made me think about my use of resources and I will be able to contribute to the school's effort to go green. This resource provides a good, clear, and concise review of the relationship between humans and and their environment (surrounding ecosystems). The case studies hook and hold the attention of the viewer in ways that more traditional methods could not; I look forward to harnessing the power of this awesome resource with my middle school scholars as we delve into 'The Environment' (Life Science Course). Very enlightening and so relevant to current issues. Good Sci Pack. Excellent pick for the free Sci Pack. Got to see how they are organized and what they offer. Good review on how the earth is one whole system, biotic and abiotic elements and the interconnectedness of the whole world. Helped me remember some earth science material and convinced me to try some other sci packs. This SciPack looks at global resources and the impact humans have on the system of Earth, with the Science Objects as follows: Earth as a System, Population Growth, Technology, and the Environment, Environmental Degradation, and Using Technoligy to Address Resource Issues. In a nut shell this SciPack describes many of our global resource problems/crises and causes and then posits preventative and redemptive solutions. I was pleasantly surprised by this SciPack. I expected the global warming issue to be hit hard in this one, but the focus was more on how certain real problems came to be, and possible fixes. The material beckoned toward stewardship and responsibility rather than blame or boogey issues. If I get a chance to present highly charged issues (doesn’t happen too often in math class) I would like to handle it in a similar way as this author. “Come let us reason” is an approach that builds knowledge and capacity for sustainable decision making. A helpful review of concepts relating to the relationship between humans and surrounding ecosystems, this SciPack covers a broad range of ecology and energy related topics. Engaging case studies provided new ideas for relating these concepts to my middle school students. This learning tool is superbly unbeatable. Learning is fun, quick, and effective. All the more I hunger for learning. This was very informative and gave excellent examples for deepening your knowledge about environmental issues. The simulations were very interactive and helpful with understanding the concepts. Overall this scipack was very interesting. I learned additional things and refreshed past knowledge. The only thing I really struggled with was the final assessment. I think it would be great to allow people to see their right and wrong answers to help better their next attempt. In doing so yes, students could narrow down their options and possibly get an extremely high score the third attempt, but you could narrow it down to two attempts if that became a problem. Moreover, it would bring up the assessment analysis, but bring me back to what I had already read, which I thought wasn't beneficial for me. This is because I reread things and then took my second attempt and still didn't see any of my past answers except for one question wrong. That is the only thing I did not like about the scipack. Very beneficial though to help students better their understandings of certain areas or to simply become more aware of certain things in science. Great scipack! This SciPack has a good clear relationship between human impact and the world's resources. It has a nice range of topics that gives a wide view of everything. Good, but a bit simple. I found completing this SciPack an enjoyable exercise. It covers a nice range of topics related to the impact of humans on the environment and the types of alternative and renewable fuel sources. The interactives were nice and added to the overall quality of the product. My favorite part of the SciPacks is the pedogogical implications which helps to pinpoint common areas of student misconceptions. Overall a nice resource for the new environmental science teacher. I thought the course was pretty straightforward and the test fair except for the question that dealt with social, political, and economic factors. It seemed like some of the choices could have been in more than 1 category and the distinction was not clear. Very poor question. I teach HS biology and I thought this scipak was a great overview of topics. It explained concepts in an easy and concise way. I also agree that some of the questions could be answered with prior knowledge. If you are teaching Earth Science or Environmental Science, this is definitely a resource that you want to check out. It clearly explains human impact upon the planet and ways that we can reduce it. It also goes through many of our energy producing resources and looks at the benefits and drawbacks of each! I've just started with this learning experience but I am learning a lot. The layout is easy to use and the material is current. I like how the check points are laced throughout. Although you can skip around, I found that I had to go back to some of the information to verify the accuracy of my answers. I have only completed the introduction and section 1 as of today's posted review. This was a good overview of the very basics in the environmental concerns facing our world. A nice overview -- or refresher. I liked the graphs and statistics offered. The SciPack was fine, but I felt that the material was at a very basic level. I don't know that I learned a lot from it, and I think I could have passed the assessment without having read the sections. However, the material is valuable, and contains important reminders that nothing we do is without a cost somewhere. This is a lesson our students would do well to learn, and if this SciPack can help get the message out, that's great. covers a lot of information in a very entertaining way! The resources and Human Impack Scipack is a really good and informative scipack. The interactives are fun and engaging to play around with. I recommend this scipack for anyone. This SciPack does a nice job of pulling together a lot of concepts about how we affect our environment, and how our environment affects us. There are thought-provoking sections on technology, both positive and negative, as well as a solid introduction to both biotic and abiotic factors and environmental ecology. Good for the elementary and middle school teacher who needs a quick background, and for the high school teacher who needs an organizational framework and a starting point.